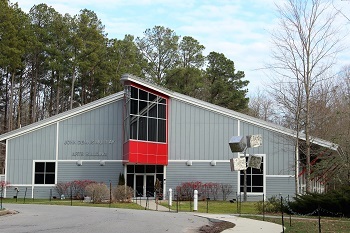 Annmarie Sculpture Garden and Arts Center has transformed part of their Main Gallery into artist studios giving the general public an opportunity to watch various types of artists work. Chosen through an application process, the artists are given a space to set up their individualized studio for a one-to-two week period. 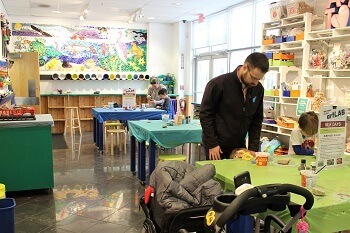 Visitors are encouraged to observe and interact with artists while they work. 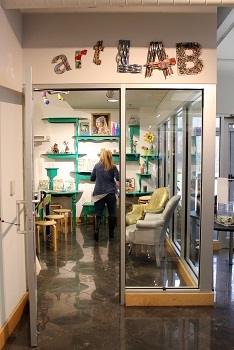 Open through February 26, the four studios will feature more than twenty artists that will work in a variety of mediums. 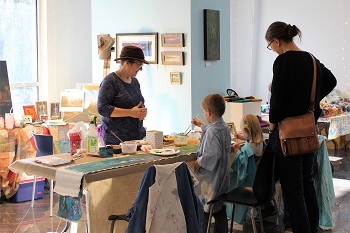 Artists are encouraged to develop new works, display and sell their work, network with other artists, and share their creative process with visitors. 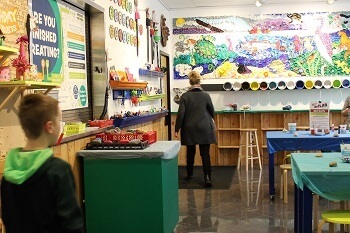 Visitors are able to watch, learn, ask questions and in some cases, become engaged in an art project. The artists’ works are available for purchase. 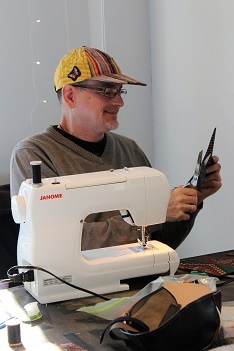 Billy Simms works with prints, sculpture, mixed media, hats, puppets, lighting design, photography, comics and much more. 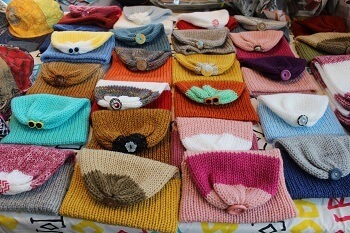 Mr. Simms is from Ohio, and recently took courses in soft sculpture that inspired him to create colorful ball caps. 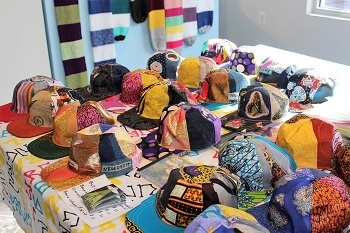 The baseball caps will remind you of colorful crazy quilts. 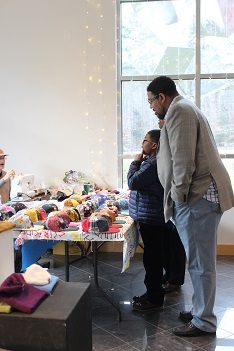 He was working on a hat when I met him and we discussed several of his future projects that will include soft sculpture. Mr. Simms also loves to work on large projects that tell a story. To learn more about him visit www.billysimmsart.wordpress.com. 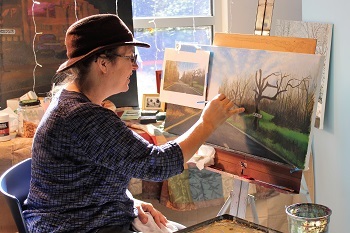 Suzanne Shelden, a local artist, is well-known for her Maryland Route 4 paintings, a series that features barns and landscapes viewed driving Route 4. Suzanne works with acrylics, oils, collage and mixed media, watercolor, photography and computer digital. 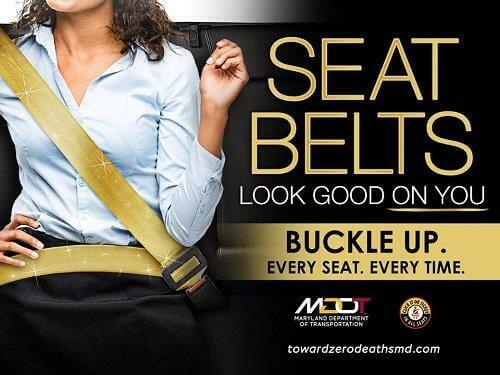 She is currently working on a Maryland Route 4 scene that those who commute to Washington, DC, will recognize. The scene is a barn located just north of the Calvert County line. 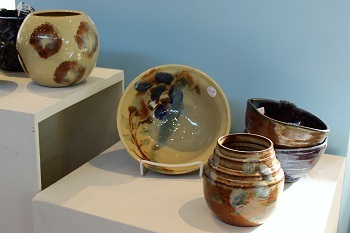 You can also see her artwork at CalvArt Gallery, located in Prince Frederick. 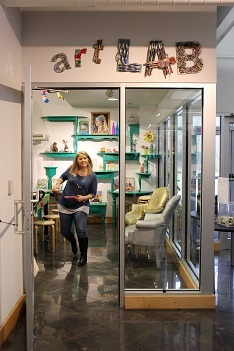 To learn more about Ms. Shelden and her artwork visit www.sheldenstudios.com. Joan Wiberg is an artist, oil painter, Plein Air artist and printmaker. A native Virginian, she is a member of the Fredericksburg Plein Air painters. Her art is bold and full of vibrant colors. According to her website, she enjoys painting on locations whenever possible. Ms. Wiberg taught art in public and private schools for over twenty years. 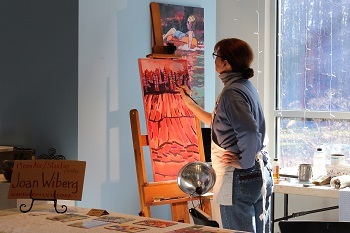 You can see her art at Middle Street Gallery, Washington, VA. For more information visit her website www.joanwiberg.com. 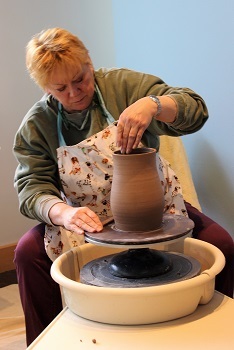 Diana Manchak works in pottery. 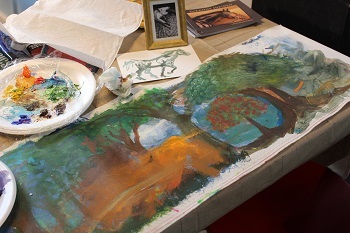 After many years in the travel industry, she now focuses on a lifelong interest, art. Working from her studio in southern Maryland, she creates art that is “interesting, balanced and visually fluid.” On this day she was using a wheel to create a piece. 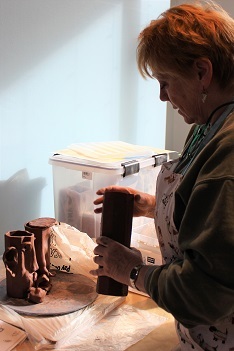 She took time to show me another piece she was working on – cups that will fit within each other that will form a tower of faces. You can view Ms. Marchak’s work at the North End Gallery in Leonardtown. 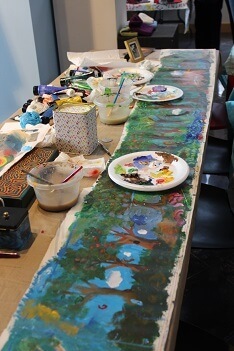 To learn more visit www.northendgallery.com/members/meet-the-artists/diana-manchak. 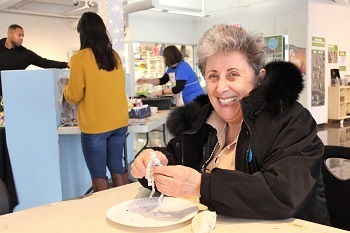 Annmarie Sculpture Garden strives to nurture artists interested in community and public art projects. They provide opportunities throughout the year to engage with the public in their work. 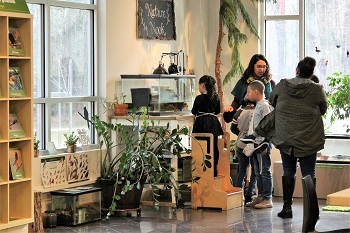 In the spring, artists are invited to submit proposals for a public art project or a community art project that could be completed within two to four weeks between March and May. 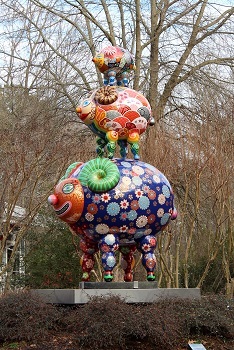 These projects sometimes result in short or long term installations at Annmarie Sculpture Garden. A summer residency is also available that runs from June to August. 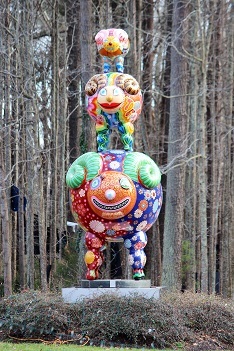 For more information Annmarie Sculpture Garden and Art Center, its exhibits and hours, visit www.annmariegarden.org. 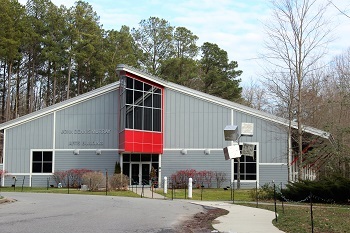 Annmarie Sculpture Garden & Arts Center is located at 13470 Dowell Rd., Dowell, Maryland. Their phone number is 410-326-4640.